Each year, a dozen of North America’s most dedicated, gifted and promising young jazz musicians are chosen from a broad field of talented applicants, receiving scholarships to participate in the Vail Jazz Workshop. 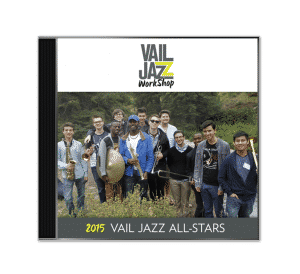 After 10 days of intensive study, the students are proudly referred to as the “Vail Jazz All-Stars,” performing on several occasions as part of the Vail Jazz Party. This double cd features the 2015 Vail Jazz All-Stars, and their performances from Thursday, September 3 – Sunday, September 6 at the 21st Annual Vail Jazz Party. Over the Vail Jazz Party, the Vail Jazz All-Stars performed in two sextets, the Alto Combo and the Tenor Combo, and all together as a whole. Buy your copy today and you will be stunned by the incredible talent of these young musicians, as composers and performers. All sales benefit the 2016 Vail Jazz Workshop; help us support the future of jazz! Please note that this is a preorder and the CDs will be ready to ship by December 1, 2015.